...... you want to export a quality list. Save file format as text and optionally include: the title of the page, the description, the URL, and the first page of the URL ect.... 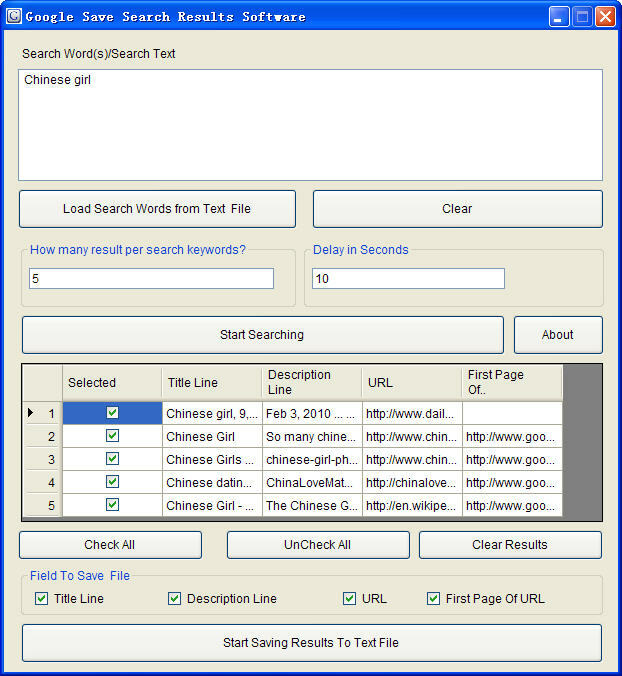 Fans Google Save Search Results Software will save you time by returning and formatting a customized search list. Eazy-to-use! The Google search engine is now more accessible than ever. A free, time-saving tool for searching multiple software sites. ActiveX DLL provides an interface to the Google Web APIs service. Qweas is providing links to Fans Google Save Search Results Software 3.0 as a courtesy, and makes no representations regarding Fans Google Save Search Results Software or any other applications or any information related thereto. Any questions, complaints or claims regarding this application Fans Google Save Search Results Software 3.0 must be directed to the appropriate software vendor. You may click the publisher link of Fans Google Save Search Results Software on the top of this page to get more details about the vendor.